Whether you operate your business alone or you manage a team of ADI driving instructors, our driving school websites at QuickontheNet.com will scale up or down to meet your needs. We are talking about QuickontheNet.com, the unique web templates service from Quick on the Net Limited. If you buy a website design template from our designs web page for your school of motoring, it will be supplied using the logo graphic, layout and style you see presented when you click-through to view the site in question. 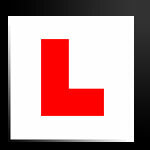 L plate logo (red or yellow learner plates). The full feature list is simply far too long to present here, so please visit our design templates overview page for more information on this unique offer. We invite you to click and browse through the range of driving school web templates and please remember, web hosting is already included as part of the service.